news National broadband provider iiNet has revealed it is taking the lion’s share of customers who have connected to the National Broadband Network so far, with other large ISPs such as TPG lagging behind due to their unwillingness to engage with the new national network. In late January, the National Broadband Network Company released its latest set of rollout statistics covering the period up to December 2012. At the end of December, the company said, it had some 34,500 customers using the NBN, with the majority of those (23,100) using satellite services, and the rest predominantly using the network’s fibre offerings. In a statement released last week, iiNet revealed that more than 10,000 of those customers were its own. “Award-winning service provider iiNet has connected more than 10,000 customers to the National Broadband Network (NBN) across fibre, satellite, and fixed wireless services,” the company said. 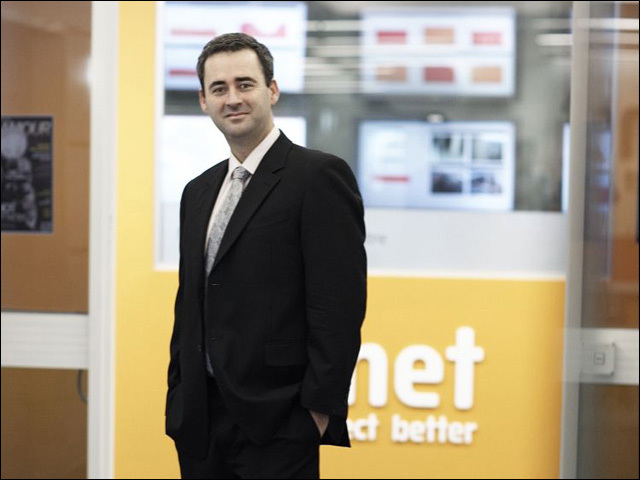 iiNet chief executive Michael Malone said the milestone reflected iiNet’s support of the project and experience in connecting customers to super-fast broadband. iiNet and its sub-brand Internode were two of the earliest Australian ISPs to focus on providing services over the NBN, with the pair being some of the earliest to release prices for access to the network in mid to late 2011. Major players such as Telstra and Optus were slower to release equivalent NBN plans, and the fourth major player in the Australian market, TPG, has not yet released any formal pricing plans for the NBN, although it has promised at various stages to release so-called ‘unlimited’ NBN plans. iiNet’s growing share of the NBN customer pool will dramatically change the market share dynamic of the Australian telecommunications market if it continues. Currently, Telstra remains the dominant player in the fixed-line telecommunications industry, with Optus, TPG and iiNet broadly dividing up many of the remaining customers between them. M2 Telecoms has recently emerged as a fifth major player following its acquisitions of People Telecom, Primus and Dodo, but its total market share is not yet clear. “Unfortunately, at this time there is not much information about the National Broadband Network (NBN) rollout other than what you may know from NBN’s public announcements,” the company appeared to add. “The NBN could not be rolled out nationally for years to come, and even when that time does come, we do not see that it will not affect any existing TPG customer who chooses to remain with us. We are confident that even after any NBN is implemented, TPG will continue to lead the market with value plans. In the mean time, TPG will continue to provide our customers with the best possible value broadband services. Telstra’s market share in the early stage NBN market may also have been hampered by the fact that the telco still requires NBN customers to maintain their existing copper-based landline telephone connections to use use the NBN, despite the fact that they have fibre broadband connected. I’m not surprised that iiNet is taking the lion’s share of NBN customers. The company, as well as its Internode brand, went in hard, and went in early to attract NBN customers, while most other ISPs were sitting on the sidelines still examining the whole process. In my view, this is a great thing, and I’ve long been an iiNet customer and consider the company to be currently the best ISP in Australia. However, I’m sure the big guns will get a lot more competitive as the NBN starts to achieve some scale, and of course Telstra and Optus have received funding from NBN Co to directly cut their customers over onto the NBN as it’s rolled out. Oh no maybe incumbent ISP’s will need to offer better value or risk their customers deserting en-mass. telstra and optus don’t need to get involved early on. they have the benefit of being able to convert their huge customer base by default when the copper gets “cut off”. i know i’ll be going with iinet when i get nbn later this year. They just need to wait for Abbott to kill the FTTP rollout and deliver them the whole market on Telstra’s proprietary FTTN system. yes there is also that. how would they know they have the most amount of customers? I would assume because the stats are out on how many houses are connected, iiNet can look at their figures for how many NBN customers have vs this figure. Because we know through public record that there are only 30k active NBN subscriptions. If iinet have 10k of them, that means they have the most as there are 40 RSPs to take up the remaining 20k with virtually none of them on Telstra, and very few Optus or TPG (rounding out the big 4). What’s the source of the “virtually none of them on Telstra”? Expose? There is nowhere in any competition legislation to prevent a business selling through multiple brands. The information is also widely available, just visit the ASX website and anyone can download iiNet’s annual report and see their entire corporate structure, or perform a google search on any of their businesses and you will find all the information you could want. The ACCC does look at mergers to ensure there is no reduction in competition, to date they have not found issue with any of iiNet’s acquisitions. Jason is just anti iinet thats all. The competition exists; its just iiNet and its subsidiaries are offering a better deal. Thats not “no competition” that is “competition working exactly as it should”. Customers go to the places with the better deal. If someone figures out how to offer a better deal, they go there. Better is not always a price based decision. It is a factor of auality of customer service, quality of product, price, and even marketing (ie being the “cool” brand can affect if a product is perceived as ‘better’ or ‘worse’). Obviously, price has a very high weighting in the broadband market. And you are worried about iiNet owning a coup,e of ‘relatively’ small companies? Expose that which is prominently advertised? Why should the ACCC get involved Jason? Oh dear we can’t have that… bring on the election so we can again enshrine Telstra. As it looks very likely the NBN will not go ahead as planned it is worth consideribg what we will lose. Even if it turns out that the LNP downgrade the NBN, it’s hard to imagine them turning off the open-access part of the system (I hope). So worst case, iinet continue as before in a lower friction market than DSL offered. If it turns out that the NBN continues to go full steam ahead, then if iinet becomes synonymous with NBN, it may well be a great marketing ploy to disenfranchise the incumbents. You think? I expect something along the lines of Tony Abbott saying “Government should not own telecommunications infrastructure”, followed by a sale to Telstra (after an “open” bidding process). Congratulations to iiNet on their success, now well and truly in the top 3 Australian ISPs. Sadly, as a 10+ year subscriber, I am dismayed they now have service and response times to rival Optus and Telstra too, in many cases much worse. Good on you iiNet to get NBN processing easier with iiNet than any other ISP. I am still on broadband with iiNet , still waiting for the NBN to be roll out in my area before I can switch to NBN with iiNet. Amnet, my ISP of choice here in WA, only recently unveiled that they were entering into the NBN market, along with new “simple” plans for their current ADSL2 services: Basically there’s entry-level (15gb up/down, $30), typical (250gb up/down, $50) and heavy (1tb up/down, $100) usage plans, with totally unlimited weekends and services shaped to 256/256. I don’t know what the NBN plans they’ll be offering will be like, but I think that they might just use the same tiers, perhaps tying each quota tier to a speed tier, 25M, 50M, 100M respectively? Either way, Amnet is my ISP of choice for its generous quota and excellent customer service with practically zero on-hold time since I signed up with them years ago. Even if they end up charging a little extra for the NBN service, I’ll no longer be paying a $20 premium because I’m on a non-enabled exchange, and I will also get to drop my Telstra phone line… I will almost certainly be saving money. But now I’m just concerned that I won’t even get the NBN since the Coalition, should it come into power, will hamstring it. And as I am on a RIM, will I even be able to get FTTN in the Coalition’s plan? Can anyone enlighten me? Just found out I’m on the three year rollout plan YAY! Hey Renai, Did iinet pay you for this article? If I were you I’d be worried about a mad monk Abbott gov getting in and you getting shafted, I think even folks in the 1 year rollout will be lucky to get fibre only because they are covered by existing contracts. I’ve only recently discovered that I’m in the Sep ’14/’15 rollout. So if the Coalition win the election I will be expecting FttN to be starting to rollout quicker. I.e. prior to Sept 14. It’ll take them at least 1.5 years before a single node will being installed – first they need to buy/lease the copper (1.5 years right there based on previous negotiations which have to include Telstra share holders and the accc signing off on the deal). MT makes it sounds simple but that is pure BS, I actually think it would be closer to 3 years before the fist node could be rolled out and the skills required for the node cutover are vastly different to those required for an FTTP rollout! No, no, no… you miss my point. That’s taking MT on his word that he will deliver his network faster. Why should we castigate the NBN for not delivering as they said they would and let MT off? Sorry Djos… I realise now that my comment was a bit ambiguous (almost sounded like a FttN supporter didn’t I …LOL). Alternatively the title of this article could be IInet lose 3k customers in 3 months while tpg gain 36k.